Orange County Chapter of the Construction Specifications Institute, Inc. The Construction Specifications Institute (CSI) is a national professional association that provides technical information and products, continuing education, professional conferences, and product shows to enhance communication among all the nonresidential building design and construction industry's disciplines and meet the industry's need for a common system of organizing and presenting construction documents. CSI's nearly 18,000 members include architects, engineers, specifiers, contractors, building owners, facility managers, and product manufacturers. Its policy of industry-wide membership has resulted in improved communication and unprecedented teamwork to develop innovative products and services of benefit to all involved in nonresidential construction. The mission of the Orange County Chapter of the Construction Specifications Institute, Inc., is to provide its membership with both the opportunity and a forum to share ideas and information openly with others in the construction industry in order to create and sustain the built environment, while recognizing and responding to changing industry trends. It is also our purpose to promote improved industry communications, techniques, and procedures, as well as preparation, delivery, and use of Construction Documents. Of equal importance is the recognition and encouragement of exceptional quality of professional endeavors, while promoting and participating in the individual member's professional development and continuing education. Each individual member pledges, to the best of their ability, to promote closer relations, communications, and cooperation among the Chapter's membership. 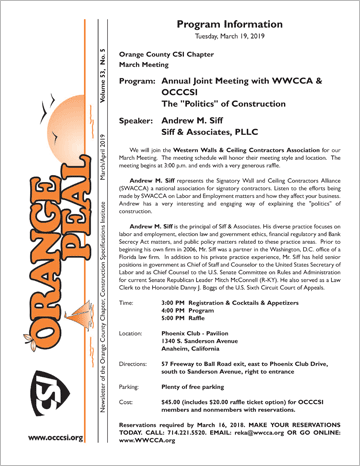 Whereas, the Orange County Chapter is an autonomous subsidiary of the Construction Specifications Institute, Inc., it recognizes the value and responsibility for interfacing its programs, activities, and goals with those of the Institute in order to maximize the benefits to each individual member. When asked, irrespective of any potential personal or professional gain, to provide the most accurate, candid, and impartial counsel possible.